(1) The heads are "flat", that is, rectangular, and the tuning key only goes onto the pin in two orientations, 180º from each other. This means that often you must put the key on the pin in such a way that your hand is rotated to a uncomfortable position, making good control difficult. Modern pins have a square head, which, in combination with a modern star tuning key, allows the use of 8 different orientations, meaning your hand can always be in a comfortable position for best control. (2) Old pins have a light threading "chased" on them with a file, except in very early instruments, which often have unthreaded surfaces which are nonetheless irregular and by no means smooth. Modern pins have a regular lightly-cut thread, allowing smoother turning in the pinblock but requiring the changing of broken pins without removing the pin from the block. 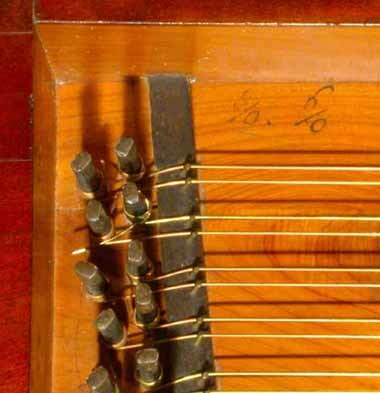 Generally I use modern pins (so-called "zither" pins), because in my experience I have found them to make tuning so much easier. Their low cost is an additional advantage. I admit they are not as attractive as original pins, but most customers would rather have the ease and comfort of tuning over the less-important visual aspect. 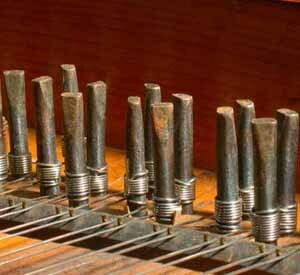 Tuning pins are usually hidden underneath the music desk, in any event. For those who want old-fashioned pins, I am happy to make them myself - at additional cost. I do not use the so-called "historic" pins which can be had from a variety of modern suppliers, as these pins are not like real old piano pins. 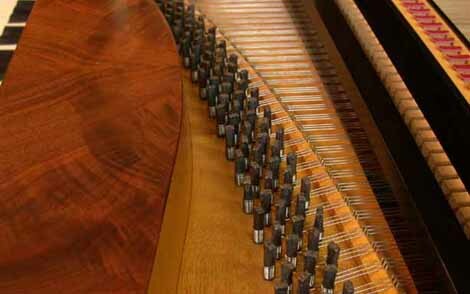 Modern "flat" pins are made for harpsichords, and are too thin at the top. This makes them too flexible for the higher tensions of pianos strings. Instead of turning in the pinblock, they have the nasty tendency to just twist until they jump, making fine control difficult. Their surfaces are also completely smooth, while old pins have chased threads and/or irregular surfaces; a none-smooth surface seems to help greatly in preventing the problem of the pin sticking in the hole and then suddenly jumping instead of turning smoothly. From left to right: a modern "historical" pin (4.5 mm), an original pin from a Fritz piano c.1810 (5.2 mm), one of my shop made reproduction pins (6 mm), and a modern "zither" pin (5 mm). The modern "historical" pin has a perfectly smooth surface and a thin head. The rough surface and the filed threading can just be seen on the old pin. My reproduction pin also has a filed thread and a nice thick head. The zither pin has a square head and a regular machine-cut thread. The different diameters are merely the pins I had at the moment and have nothing to do with the type of pin per se. 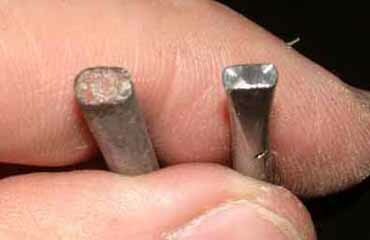 Here the difference between a real antique pin and a modern pseudohistorical pin can more easily be seen. The head of the modern pin is much thinner, making the pin susceptible to torsional distortion while tuning. The old pin is almost more square than it is flat. Once you've seen enough old instruments, the appearance of these modern fakes is every bit as anachronistic as that of zither pins. Another view of the same pins. 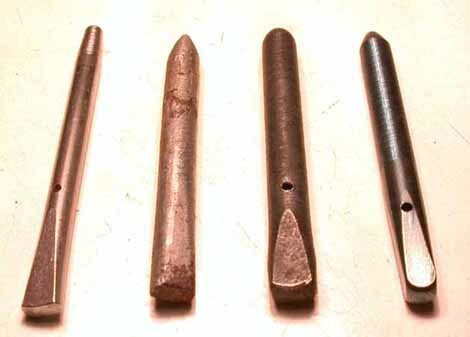 The fourth pin from the right clearly shows how thick these pins are; they are only flat enough to allow a tuning wrench to get a grip upon them. There's one more way in which old pins are different from modern pins: holes for the wire. I recommend the use of holes, even when old pins are copied. Wrapping pins without holes is not difficult, but it is a skill that must be learned and practiced. Most players never have to change enough strings to get really good at it. Furthermore, strings have a nasty habit of breaking just before a concert; this is certainly no time to learn how to wrap a tuning pin in an historic manner! Some people assert that drilling a hole through a pin makes is weak and flexible. To avoid this, I use the trick recommended by Julius Blüthner in his 1888 book on piano making; the hole is only drilled about 3/4ths of the way through the pin, which is plenty to grab the end of the wire and hold it firm without reducing the torsional strength of the pin.